notch on your band saw (above, left). 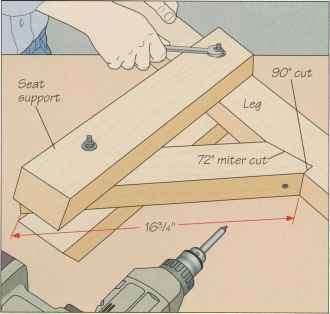 Next, use glue and a screw to fasten the brace to the leg, driving the fastener through the brace's bottom edge. Now cut the seat supports to length, beveling the front end at 30°. 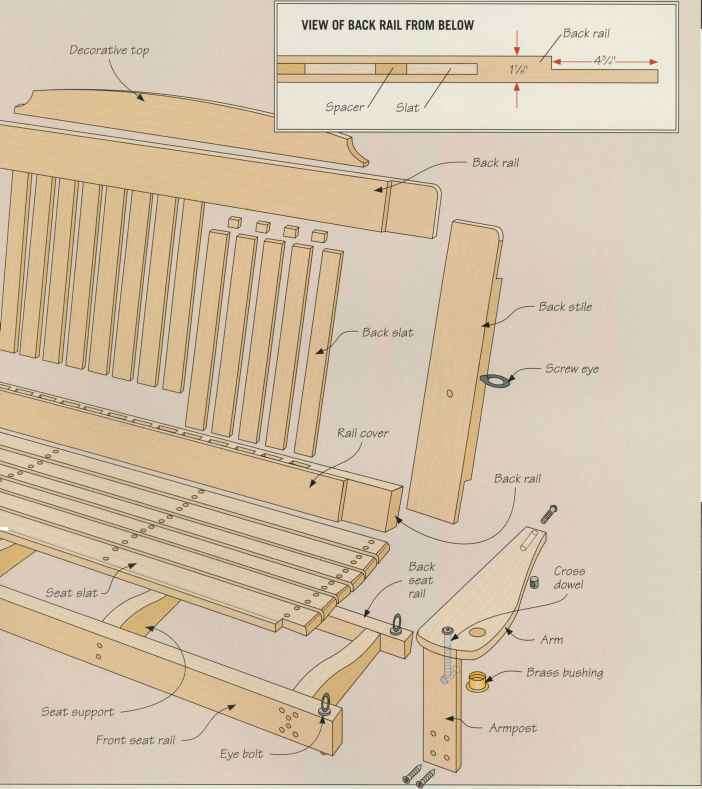 The back end of each support should be flush with the leg's back edge and the support's top edge should be flush with the top end of the brace. 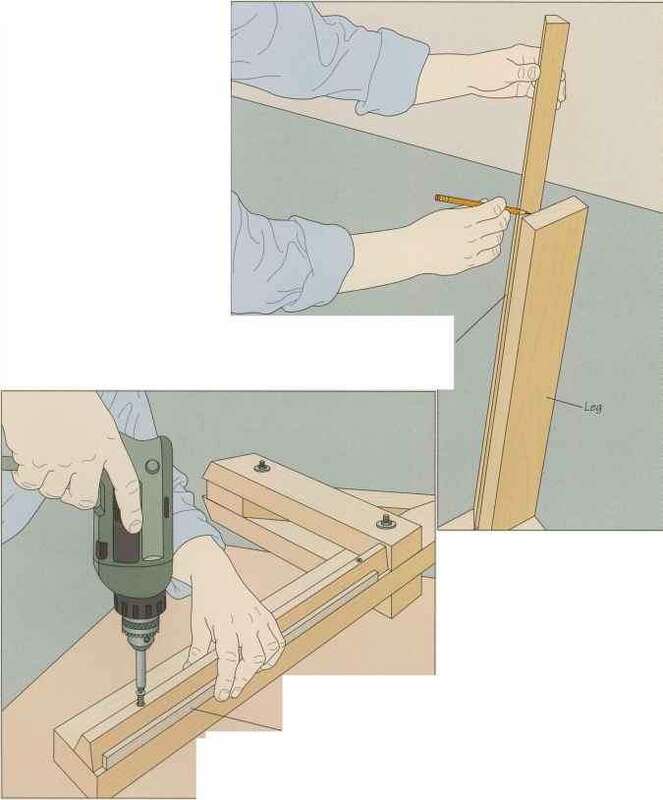 Clamp the supports in position on the leg and brace, and mark a hole at each end of both supports for a 5/6-lnch-diameter carriage bolt. Drill the holes and install the bolts, washers and nuts, tightening with a wrench (above, right). To offset the cleats from the front edge of the legs by the required 1% Inches, make a %e-inch-thick spacer that you can use to space the cleat from the leg's back edge. Drill three clearance holes through the cleat and, using glue to bond the cleat to the leg, fasten the cleat in place. Hold the spacer against the cleat and flush with the leg's back edge as you drive the screws (left). Make the 12 back cleats from lengths of l!4-by-l 14-inch stock. Rip both edges of each piece at a 30° angle so the narrow face of the cleat is % inch wide. Cut the bottom end of the cleat so it will sit flat on the seat support with the wide face flush against the leg. 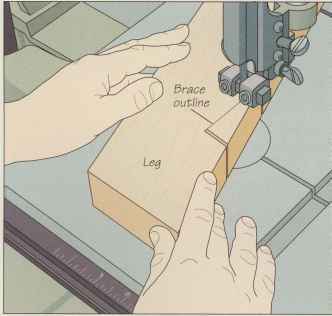 To trim the top end of the cleat, hold it in position against the seat support and leg, mark your cutting line along the leg's top end (right), and make the cut on the band saw.